Ken and I made this up when we wanted chicken Picatta but didn’t have any lemons. The result was silence for a good ten minutes while we cleaned our plates. Caramelizing the garlic sweetens its flavor, and reducing the balsamic vinegar concentrates the tang into flavor-packed garlic and caper bits. The ratios of the ingredients are completely open to personal taste. Sprinkle chicken with salt and pepper or your choice of seasoning, as long as it’s Penzeys. Grill or broil chicken until done. While chicken is cooking, melt some butter in a small saucepan over medium heat. Add the garlic and stir frequently. When the garlic begins to brown, add the balsamic vinegar one Tbl at a time, again, stirring frequently. Continue to add the vinegar and more butter if you’d like and stir until the garlic is soft, the vinegar is reduced and/or the chicken is finished cooking. Add the capers towards the end of the cooking time. Reduce the heat. Dice the cooked chicken and add to the garlic mixture. Stir. Serve over cooked and seasoned linguine or mashed potatoes. Place olive oil in a small sauté pan on medium-low heat. Add garlic, cook several minutes or until soft. Remove pan from heat and set aside. Peel potatoes, cut into 1 ½” chunks. Place potatoes in saucepan and cover with cold water. Add 2 ½ tsp salt. Bring to a simmer over medium heat. Cook until fork tender. Drain, reserving 1/3 cup cooking water. Put potatoes and water into bowl. Using a whisk, mash potatoes until smooth. Whisk in garlic and olive oil. Season to taste. Preheat oven to 350 degrees. 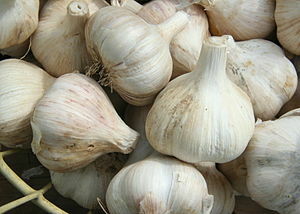 Trim points off each garlic head to expose tops of cloves. Place close together in a shallow baking dish. Drizzle heads with oil and sprinkle with pepper, thyme and salt. Roast garlic for 30 minutes. Reduce the temperature to 250 degrees and cook one hour longer. Serve the garlic with slices of crusty French bread. Pop the cloves out of the skins and spread on bread.